Everest Renjo La Pass trek is most passed trekking routes in the Everest region of Khumbu Himalaya Nepal. Some of best adventure passes during the trek is Khongma-La Pass (5535m), Chola-La pass (5368m) and Renjo La pass (5338m). This Everest trek leads the High pass Renjo-La which on the way to Tibet Border Nag pa-la and Gokyo valley. It offers to see you ancient Sherpa settlements, Sherpa Cultures, and Buddhist religion. Everest Renjo la pass trekking is one of the natural walking’s and hiking trails in the Everest region compared to other passes Congmala and Gokyo Cho La Pass Trek. The trek is our endeavor to discover Everest region through several dazzling viewpoints and the ancient trails believed to be used by Sherpa’s of late fifteenth centuries. During the magnificent trek landscapes, imposing and prestigious peaks, tapering ridges and colorful villages contribute to turning this trek into an unforgettable experience for the trekker. Everest Renjo La Pass trek begins with a dramatic scenic flight to Lukla, and the trek starts downhill to the Dudh Koshi River passing through many local villages en route. A steep climb up to the beautiful town of Namche Bazaar is full of striking views of Ama Dablam and the Lhotse-Nuptse face. Namche Bazaar is the gateway of the expedition’s route to the mighty Mt. Everest. The trek takes us through the lush vegetation of Sagarmatha National Park, with pine forests, rhododendron flowers, an abundance of wildlife and along this part of the trails friendly Sherpa people, warm hospitality picturesque village’s great variety of culture and traditions. The decline continues through Thame, Lungden following a narrow valley clogged with giant boulders to Renjo La pass. Sometimes, it is not passable without fixing rope, and crampon. So it is advisable to be equipped with minor climbing equipment such as ropes, Crampons, and Ice ax. A traverse onto the Renjo La to the solitary Bhote Koshi valley put you on the historical trade route between Nepal and Tibet. While trekking, our route passes through peace, beautiful and small yak-grazing settlements through Gokyo Lake and gradual ascent up the valley through the patches of birch and rhododendron forest making a circuit of Tawache and Cholatse. 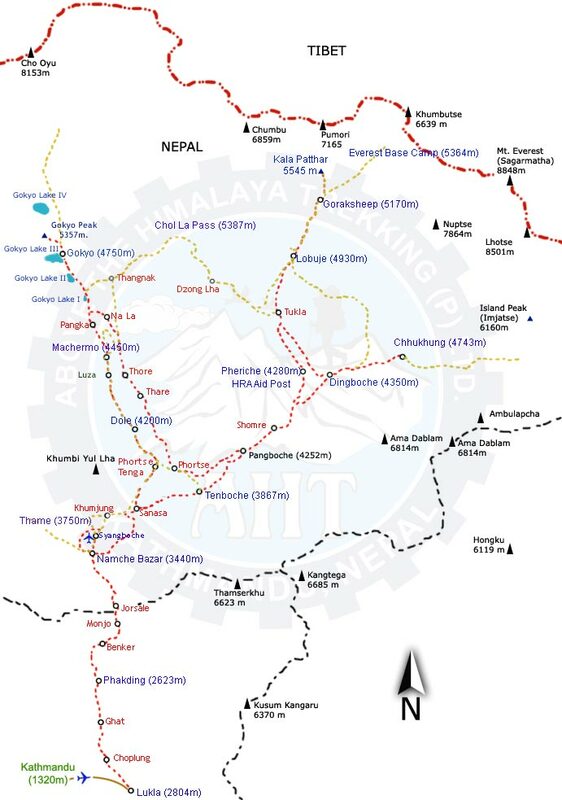 The ultimate dare is the hike across Cho La Pass, which covers Everest Base Camp (EBC) area. During Cho La Pass trek there is some short and exciting ascent of Gokyo RI, Chukkung RI, Thangnak, and Dzonglha. The Gokyo RI is considered as the best viewpoint in the entire Everest Region. Heading Lobuche is an ideal point for some spectacular views of Ama Dablam and awe-inspiring sceneries. Khongma La is beautiful pass from where we can enjoy the views of fabulous Mt. Thamserku, Mt Amadablam, Mt. Kongtega and other numerous mountains and icy Lakes. From base camp, we complete our trekking circuit by returning to Lukla down the central Khumbu Valley, including Tengboche, with its impressive monastery. 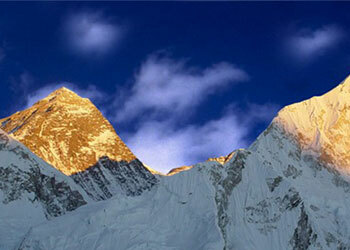 This Everest Renjo La Pass trek is well-liked and admired selected trekking destinations for the walkers. The Everest Renjo La Pass trek provides delight in adventure and widens their experience towards the expedition beyond trekking in Nepal. The Renjo-La Pass trek combines strenuous daily hiking with gratifying cultural experiences. Along with this off-the-beaten-track trail, you have the opportunity and cross-cultural privilege to stay with Sherpa families. Duration: 21 Days from Arrival to Departure. Best Travel Time: February to May, September – November are the best seasons. Dec & January are Winter and cold can be snow on the trail, June, July & August are rainy time, trekking can be done but visibility can be poor due to rain. Your trek Backpack/duffle bag: Your baggage on the trek will be carried by our porters, the maximum weight per trekkers is 15 kg including your hand carry , Other items not required on trek can be stored in our office or your hotel in Kathmandu. Today we can go for a visit to Napa Valley, which falls on the old trade route to Tibet. Hike to Darkyachhulung Peak. Visit Marlung sacred site of Warfield. Hike to Lake Cho Relmo, Back to stay in Lungden at a very simple guest house. After crossing you will descend Renjo la pass where an eye-popping vista awaits. Crossing an iron bridge over a stream the trail levels out as it follows the valley past the first lake, known as Longpongo at 4690m, where we get chance to observe the Lama footprints on a stone. The second lake, Taboche Tsho mesmerizes us by the shimmering turquoise blue sheet of water sparkling in the sun. Little we reach the third lake, called Dudh Pokhari, linked by a surging stream to the previous one. Gokyo village stands by the third lake and Cho-Oyu Mountain. Above the lake provides panoramic views of Cho Oyu, Gyachung Kang, Lhotse, Makalu, Cholatse, and Tawache. The trek to the Cho La pass can be rather a difficult route. But on the way you will be able to experience the best part of your hiking; difficult but very worthy. In good weather you can cross the Cho La with no special equipments but warm clothing and an ice axe might provide added peace to mind. The path skirts around the ridge, staying mostly level. Stop overnight at the village of Dzongla. After lunch, our adventure continues towards Everest Base Camp. The trail passes through over rocky dunes and moraine and streams. The Base Camp area provides an opportunity to experience the freezing and harsh conditions that mountaineers brave to summit this famous mountain. We explore base camp and its surroundings glacier and return back to Gorakshep and back to Lobuche. Continue downhill to Pheriche. Continue down moraine to Dughla and drop to the bridge over the gushing stream that flows out of the glacier. We will trek down through the hillside blanketed by rhododendron and juniper trees. Looking east of the Dingboche village, you’ll see the snowcapped mountains and summits of Island and Imja peak. Walk down to Tengboche(3,867m), sits on a saddle at 3870m in a clearing surrounded by dwarf fires and rhododendrons, Kwongde (6187m) Tawache(6542m) Everest (8848m) Nuptse (7855m) Lhotse (8618m) Amadablam (6856m) Thamserku (6608m) providing an inspiring panorama of Himalayan giants. We visit the monastery at Tengboche, the largest in the Khumbu region. Tengboche is a small village with a famous monastery offering you splendid views of Mt. Amadablam, lush green hills and river views. Dense wildlife of some species of Pheasants, Himalayan Griffons, Musk deer and wild goat can be found abundance inside the rhododendron forest. from Tengboche the trail crossing the suspension bridge over the Dudh Koshi River trek onwards to the Kyanjuma the junction of the trinity ways to Gokyo Valley, Khumjung village, and Namche Bazaar. Evening explores a small surrounding area with magnificent scenery. Above the Himalaya Trekking have made every effort to keep our price as competitive as possible, by still providing an excelling service to our customer. We pay our porters and guide the legal wages agreed with the porters union, our trekking staffs are some of the best paid in Nepal which allow us to attract only the best guides and porters and we have same amount of Insurance for guide and porter which is more than Government fixed amount. All our price are net and there is no hidden cost everything is clear on cost includes and excludes this is the main reason all our customer are happy from our service. For up to date cost for the trip please contact us.